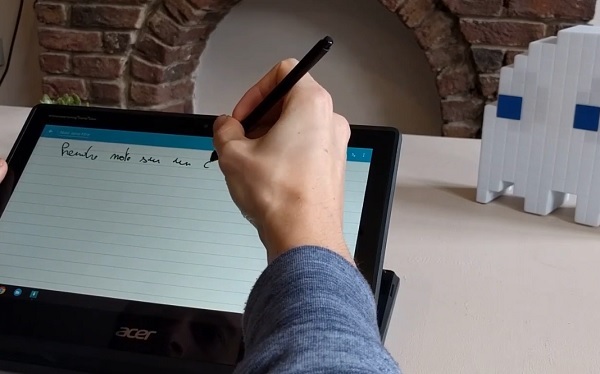 Designed primarily for use in the world of education, the Acer Spin 11 was conceived to be durable and reliable so that it would be able to withstand daily use by careless students. After having spent hours testing this Chromebook, here is my opinion about it. Practical and durable are the two words that I would choose to describe this Chromebook’s design. Conceived to withstand hours of daily use by students with clumsy hands, this computer is the most solidly constructed Chromebook I have ever seen. The edges of its case are angular while being somewhat rounded. 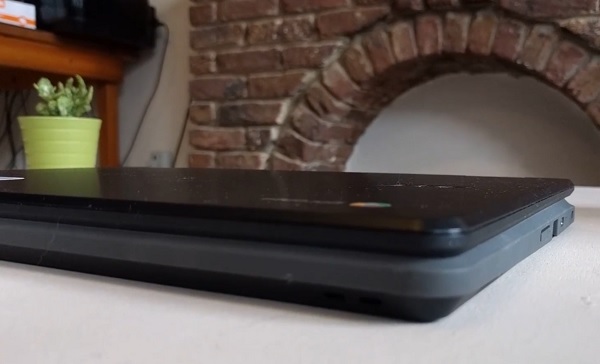 The Spin 11 has a rubberized edge which protrudes slightly from the rest of its case and which enables this Chromebook to survive falls from a height of up to 1.22 meters. In addition to its excellent shock resistance, the Spin 11 is also splash-resistant. 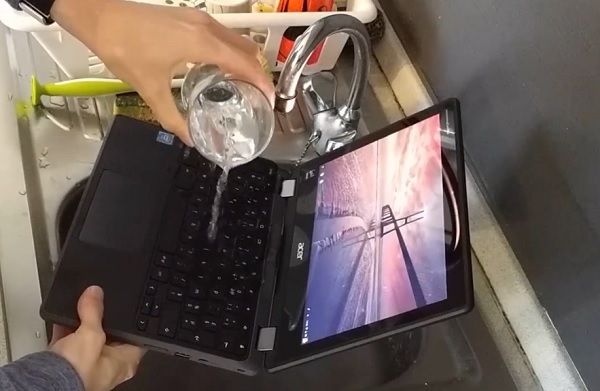 To illustrate this point: 300 ml of liquid can be safely poured over the Spin 11’s keyboard thanks to an integrated drainage system which protects this computer’s essential components. On the bottom side of this device can be found the four feet which hold the Spin 11 securely in place as well as the two speakers located towards its front side. In terms of available ports, I was very happy to find that this computer has not one, but rather two USB-C ports! It is also equipped with two USB 3.0 ports as well as an audio jack and a micro-SD card reader. 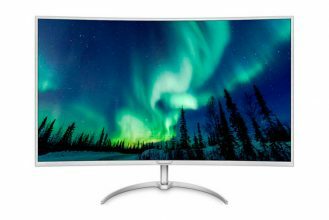 This computer does not lack any essential connectivity, but given the absence of an HDMI port, you will need to make use of one of its USB-C ports in order to hook it up to an external display – something which is still far from being common practice. The Spin 11’s second greatest asset, after its impressive durability, is its reversible touchscreen. This computer’s display measures 11.6″ and has a resolution of 1366×768 pixels – basic HD definition – which is more than high enough for a display of this size. The Spin 11’s display also has good visibility when it comes to reading articles or watching videos. This Chromebook’s display has good luminosity; the luminosity level can be set quite high, but hot high enough to be used outdoors. That’s enough about this display’s quality…let’s discuss its functionality. In addition to being reversible, the Spin 11’s touchscreen also possesses the rare ability of being compatible with a stylus. You are probably thinking: “wow, a stylus…does anyone still use such ancient technology?” If that’s what you were thinking, try taking down notes or drawing on a touchscreen without a stylus, and then we’ll talk! 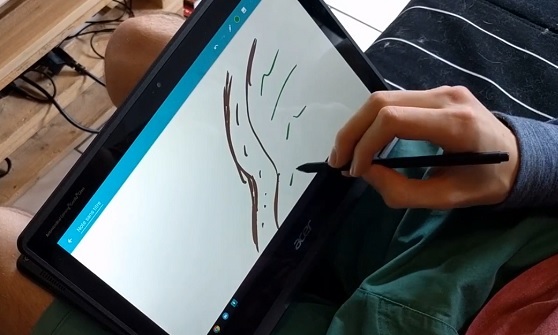 Given how rare this feature is, I had never used a stylus with a Chromebook before, and I must say that I was completely blown away by how useful a stylus can be. Being a student myself, I know all about taking down notes. Typing works well until the professor decides to start drawing a diagram on the blackboard. I am usually very happy to take down my notes using my Chromebook, but when such a situation arises, I find myself having to get out a sheet of paper in order to draw the diagram the old-fashioned way. 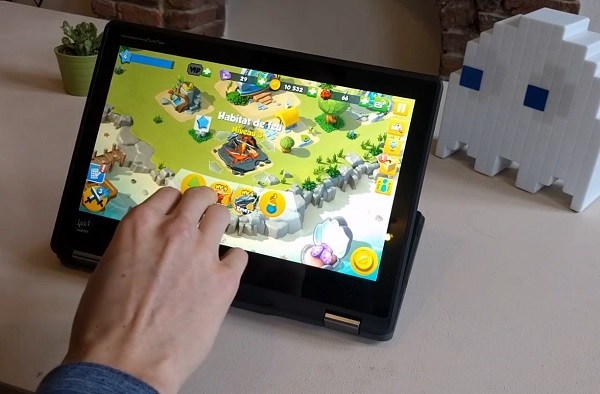 I understand now why the Spin 11 is geared towards students and the value that its advanced tactile functionality can bring to the classroom. And even outside of the classroom, this could be a great computer for a small child to have fun drawing on for example! I must admit that I was initially skeptical about using a stylus with a Chromebook, but now I fully understand the advantages it provides. And if I had to choose a Chromebook to give to a small child, I know exactly which one I would choose. 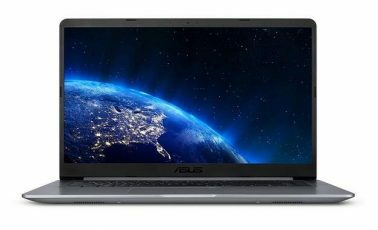 I would like to say a few words about this Chromebook’s audio. I noticed that it was able to reach a high volume level while maintaining clear sound, regardless of its position. Whether this computer is placed in desktop mode, presentation mode or tablet mode, it is always able to deliver decent sound. While 11″ laptops often have an excessively cramped keyboard, I was pleasantly surprised to find that I could type quite comfortably on the Spin 11. Its keys are reasonably large and well spaced out. They also have excellent responsiveness. As you might imagine, they are in keeping with the computer’s overall ruggedness and you can really apply a lot of pressure to this keyboard without having to worry about damaging it. I was also pleasantly surprised by the quality of this Chromebook’s trackpad. It is quite large for such a small computer. It is also very comfortable to use and has excellent responsiveness. With its 4 GB of RAM, Intel Celeron N3350 processor and 32 GB of eMMC storage, the Spin 11 offers a basic level of performance which should be satisfactory for standard usage. Web pages load instantly and you can have many tabs open at the same time without negatively impacting on the computer’s overall performance. I was even able to run several Android applications without any problems. It must be said that its Celeron N3350 processor is a great help; it is a much more modern processor than the one found on older Chromebooks such as the Acer 14 or the Acer R11. The Spin 11’s wireless connectivity (like that of all Chromebooks) is excellent; it is equipped with Bluetooth 4.2 in addition to WiFi 802.11ac. The Spin 11’s advertised battery life is 10 hours, however, during my testing, I noticed that its battery autonomy during normal usage is only around 7 hours. That’s less than the advertised 10 hours, but it is still long enough to allow the Spin 11 to last for an entire day without needing to be recharged. Decent autonomy, despite being lower than what Acer claims it to be. 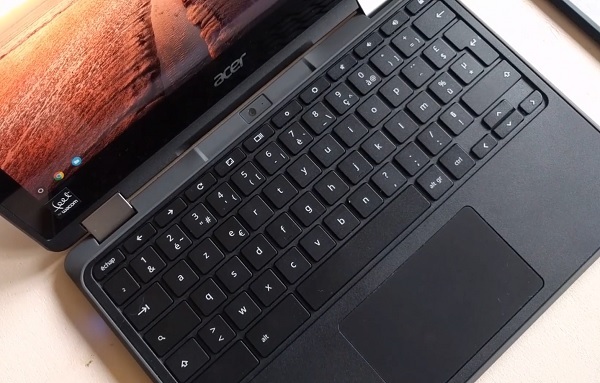 Should you buy the Acer Spin 11? It is obvious that this Chromebook is not for everyone, and it doesn’t pretend to be either. Essentially conceived for use in classrooms, this computer is ultra-durable and highly functional. It has many positive aspects such as its stylus which enables easy note taking and which opens the door to a more artistic type of usage. This Chromebook is probably better suited to children or students rather than to adults. That having been said, if you are interested in a highly durable computer that can be used with a stylus, you won’t find anything better than the Spin 11. If you are looking for a shock-resistant Chromebook that can be used with a stylus, the Acer Spin 11 would be an excellent choice. Next Guide: How Much VRAM Do I Need for Gaming? Is 2GB or 4GB VRAM Enough?